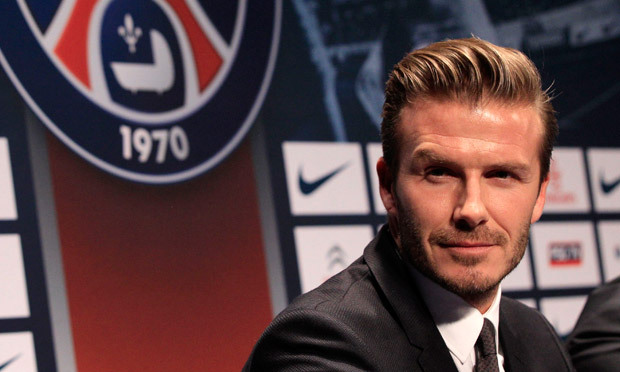 Becks in Paris, Becks in China. His guns are for hire. David Beckham is the biggest star in the world. I challenge you to think of anyone, even the biggest Hollywood star, that has a swoon factor for both sexes that he has - and in such diverse cultures. America or China, they can't get enough of him. Big in the east, big in the west, even big in Budapest, to quote Chas and Dave. Brand Beckham is pure gold to a nation or corporation wanting to promote their lot and he was for hire again this week. The client couldn't have been bigger: China. I’m certain I watched an ad for Becks at Sainsbury’s leading upto the feature in the news. The former England skipper arrived amid competing paparazzi and the closest attentions of crazed fans. Chinese kids mobbed him like the Beatles were back in the 60’s. He had a kickaround in his suit and passed the ball around in a pedestrian manner not dissimilar to his years as an LA Galaxy midfielder. He also denied he was there to put the sheen on a sport tainted by corruption. He was there, he said, to promote the Beautiful Game – using the Brand, a sheening commodity that hangs limpet like to his body. Becks can talk about something as abstract as his brand, yet says noodles are his favourite Chinese dish. But that’s Beckham for you. Noodles is also his favourite Italian dish too. Infact, one man’s noodles is another man’s lockshen. But whatever the shape of his pasta, Beckham's for hire and the world wants his stardust.